The recent avalanche of information and opinions regarding cancer screening may be leaving healthcare understandably confused, particularly as it relates to older patients. In the last five years, the US Preventive Services Task Force (USPSTF) and many organizations of primary care physicians have recommended against prostate-specific antigen (PSA) screening in men aged 75 and older, then recommended against PSA screening in all men. Additionally, the USPSTF has recommended against routine mammography in women aged 40 to 49 while still supporting it on a case-by-case basis for women at higher risk. The organization recommends mammograms every other year for women aged 50 to 74 rather than yearly. Further, it has recommended against routine screening colonoscopy in patients over the age of 75 and against any screening colonoscopy in patients over the age of 85. What is going on? Is this discrimination against the elderly? Are economists driving it, as some have suggested? Actually, no. The committee making these recommendations did not consider cost. Instead, it was addressing these questions: What is the best thing to do? What policy results in the least harm and the greatest benefit? To understand this issue we must understand the concept of overdiagnosis. It occurs when we find a disease that never would have been found if we had not looked for it and never would have bothered the patient. Nevertheless, once we find this disease, we feel obligated to treat it, particularly in the case of cancer. So overdiagnosis increases the burden of illness by creating disease where it would not otherwise occur. PSA testing for prostate cancer is the clearest example of overdiagnosis. Prostate cancer is very common. Autopsy studies of men who died of other causes, such as heart attack, reveal that as many as one-half of 60-year-old men have some evidence of cancer in the prostate. But the vast majority of those cancers never become symptomatic, never cause trouble. Many may grow slowly or not at all. Some spontaneously regress and disappear. But with routine PSA testing many of those hidden cancers become diagnosed. Of course, once a person is diagnosed with cancer, treatment is almost inevitable. The introduction of PSA testing led to a near doubling in the number of men diagnosed with and treated for prostate cancer. It has been estimated that 1 million additional men in the United States today have been treated for prostate cancer because of PSA testing. These men would have lived happily ever after and never known they had “cancer” were it not for the PSA test. Think about the morbidity, and sometimes even mortality, that resulted from the overdiagnosis of prostate cancer in those men. A similar story can be told for breast cancer screening, but in this case, the benefits are also clear. The randomized controlled mammography trials in the 1970s found 20% to 30% decreases in deaths from breast cancer with routine mammography use. However, several recent reports have shown that mammography also produces overdiagnosis, increasing the number of women diagnosed with and treated for breast cancer. This is the case particularly in women with a relatively low risk of breast cancer, for example, those under the age of 50 without a family history or women with a shorter life expectancy from advanced age and/or serious medical illness. That led the USPSTF to recommend against routine screening in those women. To repeat, this is not about economics or healthcare spending. It is trying to devise the best strategy to reduce morbidity and mortality. This will be a difficult case to make to our patients because we have spent the last 30 years on public health campaigns to promote the benefits of screening with nary a word about any possible risks. It is also difficult to convince healthcare providers who have heard the same message and have worked hard to promote universal screening. The path ahead will be difficult and will lead to sometimes awkward discussions. The message “always get screened” is much simpler to communicate than the message “some groups should get screened and some should not.” Changing an almost universally accepted healthcare belief will take time, but to pretend that government bureaucrats interested only in saving money are fueling the debate is not in the interests of the public health. 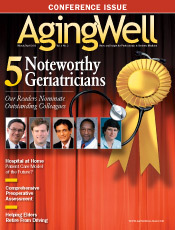 — James S. Goodwin, MD, is director of the Sealy Center on Aging and the George and Cynthia Mitchell Distinguished Chair in Geriatric Medicine at the University of Texas Medical Branch. In 1992, he started the multidisciplinary aging program that would become the Sealy Center on Aging. With more than 20 years of clinical experience, his current research involves disparities in cancer care in the elderly, reasons for overutilization of some medical tests and treatments, and predictors of physical functioning in older populations.